DANIEL SMITH currently offers 216 different watercolors, with more in the works every year. The sheer range of possibility they offer is endless and unparalleled in the industry. This amazing selection spans the spectrum from the historical, to our natural earth and PrimaTek colors (read more about PrimaTek colours here), to our Quinacridones, the brightest and boldest colors modern technology has to offer. Please Note: The 15ml Quinacridone Gold has changed and the new colour code is 284600238. The Pigment content has changed from a single pigment colour PO49 to a dual pigment colour PO48 & PY150. The 5ml Quinacridone Gold has always had the pigment content of PO48 & PY150. Aussie Red Gold is the rich, golden color of ochre cliffs set aflame at sunset. This brilliant, reddish gold will add glowing light to Autumn leaves, late summer flowers and landscapes. Aussie Red Gold is transparent, non-granulating, low staining and performs wonderfully, you will love it on your palette! DANIEL SMITH Azo Yellow Watercolor almost jumps off the paper, it's so brilliant, sunny and bright. The very essence of yellow, it's clear, powerful, vivid, semi-transparent, smooth and staining. Use this organic pigment to add light and sparkle to your paintings. It's also a versatile mixing colour. This intriguing new PrimaTek® colour is made from a semi-precious stone thought to bring luck, dispel negativity and promote clarity of purpose. In washes, especially on rough paper, it displays exciting granulation with delicate settling and a tracery of spidery runs. Intensely black in mass tone, it lets down to a beautiful pearl gray. Gorgeous in colour, Blue Apatite is a striking mineral that is rarely used in jewelry due to its relative softness. As an artist's pigment, though, it's fantastic - a dense, rich midnight blue that granulates magnificently on cold- or hot-press papers. Within a wash, nuances of color are revealed, from inky near-black to rich Prussian-like blue. Create a stormy sky in one juicy stroke! A warm honey-bronze colour with lustrous sparkle provided by very fine films of iron oxide. A warm, glowing earth colour, suprisingly smooth in washes. In a light wash, the yellow is very clean, as sunny and subtle as morning light in a French vineyard. This natural ochre was mined from a deep vein that runs near the Loire River in western Burgandy. Since the mines were closed in 1970, we feel lucky to have found a supply of this unique pigment. A beautiful earthy color, Burnt Sienna Light is redder than our Burnt Sienna, more transparent and slightly less granulating. In very light washes, it makes a good, light flesh tone for portraits, and in darker washes, it is a rich red-brown. We've done it! Safe, Vibrant Cadmium Hue Watercolours! Our new formulas provide all the density and richness of classic cadmium colours. Our hues are virtually identical in colour to their namesakes, but cleaner in mixtures and stronger in tints—you'll find a little goes a long way. Working properties—staining power, semi-transparency and excellent light fastness—are also nearly identical to those of the low-soluble cadmium colours we previously offered. Cadmium Orange Hue - A deep, radiant orange that leans slightly towards red. We've done it! Safe, Vibrant Cadmium Hue Watercolors! Our new formulas provide all the density and richness of classic cadmium colours. Our hues are virtually identical in colour to their namesakes, but cleaner in mixtures and stronger in tints—you'll find a little goes a long way. Working properties—staining power, semi-transparency and excellent light fastness—are also nearly identical to those of the low-soluble cadmium colours we previously offered. Cadmium Red Scarlet Hue - A festive, versatile red with an orange cast. We've done it! Safe, Vibrant Cadmium Hue Watercolors! Our new formulas provide all the density and richness of classic cadmium colors. Our hues are virtually identical in color to their namesakes, but cleaner in mixtures and stronger in tints—you’ll find a little goes a long way. Working properties—staining power, semi-transparency and excellent light fastness—are also nearly identical to those of the low-soluble cadmium colors we previously offered. Cadmium Yellow Deep Hue - A rich, warm yellow with a golden glow. Equal in staining capacity to Alizarin Crimson, but vastly superior in permanence, Carmine is also redder. This natural green provides landscape artists rest in a summer painting saturated with vibrant greens. Opaque and low-staining, Chromium Green Oxide mixes well to soften other colours. A brilliant purple with remarkable blue undertones and a granulating texture. Try mixing this bold colour with Prussian Green for surprisingly soft blue hues. At full strength, this violet is dark enough for deep twilight shadows. Mix with water and a range of tones are revealed. A mid-range green-yellow, useful for mixing middle value grays. Introduce non-staining complementary colours to warm or cool the mix. Cobalt Green Pale, a green-blue, is similar in application as Cobalt Green. All inorganic, they are considered transparent and non-staining (or low-tinting) pigments which are ideal for glazing methods. Their ability to create soft edges, to lift and to mix readily made Cobalts valuable contributions to watercolour palettes. A predictable staining teal blue with muscle and the presence to stand alone but when used in a glaze or wash it blends with incredible ease. At long last there exists a deep reddish-brown that reacts wonderfully to salt! These pigment qualities produce natural texture and invite applied texture techniques. Diopside Genuine is a rich gemstone green you'll reach for time and again. Also known as the Russian Emerald, he mineral is usually seen in fine jewellery. We are proud to be the first to offer it as a watercolour. Exquisite in hue, it brushes out evenly from deep bottle green through clear Kelly green to palest mint. The chromium rich stone from which it's ground is green with brownish inclusions. In washes hints of the brown mineral settle out, adding an earthy nuance perfect for landscape work. Rich colour and opacity make English Red Earth a versatile pigment that offers a range of effects. At full strength this colour is similar to Burnt Sienna although it provides more coverage and dries with a slightly matte finish. Add water to create a warm pink-brown with soft granulation. Excellent light fastness makes for a reliable watercolour. A transparent sun-baked brick red has a rose-blush undertone. This favorite among our earth pigments granulates for surprising texture and is non-staining so you can lift and move this color around your painting. A beautiful highlight for your deep crimson roses. DANIEL SMITH Enviro-Friendly Watercolours-the colours aren't green, but the process is! To make these paints, we use pigments from the earth's crust, obtained through a process known as Iron Oxide Recovery (IOR). This method removes coloured iron oxides that pollute mine water, cleaning the water so it can re-enter a receiving stream-and resulting in a cleaner natural environment. The recovered iron oxide is thoroughly washed, then used to create a trio of rich colours ranging in tone from a warm golden yellow to a deep red earth to a beautiful saturated dark brown with a bluish undertone. This versatile red-brown is deep brick at full strength. In lighter washes a warm and transparent earthy rose is revealed. A perfect brown-pink for portraiture - it's the natural looking red on cheeks and lips. Enviro-Friendly pigments are reclaimed and refined, giving you an earth-friendly option without sacrificing color quality. A wonderful brick red, the rich, ruddy color of an Irish Setter. Transparent, granulating and non-staining, it is beautiful in any strength and makes an exquisite range of skin tones. Made from pure Fuchsite, a mineral with mica-like characteristics, this colour creates a luminous pearly green shimmer. Garnet Genuine Watercolor has all the warmth and allure of the January birthstone. Our newest PrimaTek® color is a gorgeous, warm reddish-orange with similar hue but more texture than Quinacridone Burnt Scarlet. Try mixing it with Cerulean Blue for beautiful mauves and grays. It reticulates wonderfully and creates unexpected surprises in washes. Found in iron deposits nearly worldwide, Goethite (Brown Ochre) is named after Johann Wolfgang Goethe, the German philosopher, poet and mineralogist. Hematite stones are crushed and milled to a fine pigment to create a dramatic reddish brown watercolour with maximum granulation. Add texture to your work with this genuine PrimaTek pigment. Perfect for rugged landscapes and the natural texture of wood, stones and brick. Hematite is ground from a heavy silvery-black mineral rich in iron. In a thick wash, the heavier particles settle, creating bold granulation. In a thin wash, it is a soft dove gray. Hematite stones are milled to a fine pigment to create this stunning watercolour. Rich and shadowy violet washes are studded with a pattern of deep granulation. Bring excitement to neutral tones with this PrimaTek pigment—driftwood, tree bark, and rocky cliffs come alive with texture and drama. Be inspired by this rugged violet that stays true with excellent light fastness. Hematite is ground from a heavy silvery-black mineral rich in iron. In a thick wash, the heavier particles settle, creating bold granulation. In a thin wash, it is a soft dove gray. Artists choose Indian Red for architectural renderings, old brick and other subjects where a flat (matte) granular surface is desired. The opacity and density intrinsic to Indian Red make this grayed earth brown a useful asset. One coat of this low-intensity pigment covers even a highly saturated passage. This sienna is a natural orange-brown earth pigment imported from Italy. Use this and the 'limited edition' siennas with the same method and purpose as plain Burnt Sienna. Experience the perfect combination of rustic colour and refined working properties with Italian Deep Ochre. This shade has a warm brown cast and is slightly darker than traditional yellow ochre. Transparency and delicate granulation are perfect for sun-baked landscapes and excellent light fastness keeps your work from fading. Made from pigment mined and mixed in Italy, Italian Venetian Red is redder than most and smoulders with a warm intensity. An earthy red-brown with opaque, sedimentary properties, Venetian Red is great for fall paintings and applications similar to Indian Red. Drop Venetian Red into a wet Lunar Earth wash for exciting results. Venetian Red is non-staining, lifts with some difficulty when dry, but leaves a special warm afterglow when blotted at the damp state. A semi-transparent, warm opaque pigment. Historically, this black was derived from burnt ivory from now-endangered species. Thankfully, this is no longer the practice. An Ivory Black touched with yellow creates a blackened green excellent for backlit foliage. Think sumi and hand-painted stone lithographs. Can be used to darken transparent pigment. Mined in the mountains of South America, this gem-quality pigment is an opulent blue. There is not a hint of gray in this paint, with a classic, concentrated blue that is vibrant and light reflective (due to the irregular and angular shape of the pigment particles). A touch of golden pyrite as an inclusion adds a delightful shimmer. The result is an elegant, almost three-dimensional effect that is completely different from the predictable blue of synthetic ultramarine pigments. Our Genuine Lapis Lazuli is at least 80% pure gem pigment suspended in a natural binder. Lavender is a beautiful periwinkle blue, and quite different from our other blues. This semi-transparent lavender blue has beautiful granulation, and lifts easily. In addition to being an excellent floral color, our Lavender suggests certain shades of faded denim. A transparent, non-staining pigment that resembles Burnt Sienna in colour but separates dramatically. Lightfast and extremely versatile, Lunar Earth shares pigment properties with Lunar Black and creates similar amazing textures. Add texture to you watercolour paintings with this rich burgundy watercolour. Watch how this fascinating new semi-transparent watercolour with its broad range of texture, colour and value falls into unique forms across your paper. This paint creates a deep rich black or a wash of soft violet sky at twilight. With extreme granulation it's capable of creating a rugged weathered look of years gone by or capturing the delicacy of a new spring lavender flower. This versatile pigment will become a resourceful, inventive friend that you will revisit again and again. To avoid instant mud in your watercolours, select lightfast Mars Yellow. This semi-transparent brownish yellow is low-staining, an ideal substitute for more transparent, higher staining pigments such as New Gamboge or Yellow Ochre. Used to adorn the murals and sculptures of the Mayan people, this remarkable red has remained vibrant even when exposed to more than a thousand years of severe heat and humidity. Now using an eco-friendly process, with methods derived directly from the ancient Mayans, this unique, metal-free pigment is available to you. Its versatility, durability and exquisite hue will make it a color you'll reach for again and again. Bring a natural glow to your palette with this stunning sienna earth tone. Subtle granulation and a delicate transparency make this watercolour especially useful for portraits and landscapes. This low staining pigment is very workable and has excellent lightfastness. Unlike the old world colour, DANIEL SMITH'S Mummy Bauxite is extremely lightfast, semi-transparent and low-staining. You get the tonal warmth and depth of traditional Mummy with the modern assurance that the colour is strong, stable and consistent. This new azo pigment falls between Permanent Violet and Manganese Violet on the color chart. It’s a lightfast, slightly granular deep brown-violet with a low staining property, these properties make Naphthamide Maroon a surprise substitute for earth pigments, especially umbers. A rich, warm brown-green that is semi-opaque and low-staining. Olive Green lends a slight granulation and makes very convincing greens. Explore rich, wet grasslands and add density and variation to tree lines with this natural-looking green. DANIEL SMITH Payne’s Blue Gray is similar to our bluer Indigo, but like our original Payne’s Gray, it is semi-transparent rather than transparent. Inky blue and non-granulating Payne’s Blue Gray is perfect for painting dark, stormy skies, night scapes, and for quickly darkening most other colors. Imagine a rich and warm dark that can be textured with salt, squeegeed to reveal a warm residue stain and still have enough body to render glowing cedar bark in one stroke. That sums up high-staining, transparent Permanent Brown. Saturated and leaning toward yellow, Permanent Orange resembles Cadmium Orange and is lightfast, transparent and low staining. Our Permanent Orange with its’ juicy, bold orange color will add brilliancy to your florals, sunsets, sun-drenched and tropical landscapes! Semi-transparent, lightfast and permanent, this pigment diffuses well with water, a treat when painting wet into wet or damp passages. The fuzzy edges this technique produces brings field poppies to mind. The soft handling ability or even dispersion of this lightfast, semi-transparent pigment helps make this a fine pre-mixed violet. The rich medium to high staining pigment shows strong reddish-violet colour although it contains more of its complement. Mixing beautifully with other colours, Permanent Yellow Deep yields a bright tangerine hue when used at full-strength and light washes are a soft peach. A warm and golden tone makes this yellow ideal for the fiery orange-yellows of a fall landscape. In the mid-yellow to red zone of the colour wheel is this exciting find, Perylene Maroon is a semi-transparent super staining dark red-brown. Perylene Scarlet is medium staining and semi-transparent. It creates vivid, dark washes with a clean brilliant orange hue. This sedimentary pigment offers an additional health plus, as it is made from a metal-free red. Clean, modern pigments such as this will make accidental mud-making a thing of the past. A deep, luscious, grape-juicy reddish-violet. The masstone is dark and intense, shifting in tints toward a rich red violet with a brownish-purple cast. Because of its relative neutrality, it's a natural-looking choice for portrait, landscape or botanical work-imagine how good it looks with complementary greens. It also makes strong, interesting shadows. A bright, beautiful lime green with power and tinting strength characteristic of all phthalo pigments. Made from Phthalocyanine Green (yellow shade) and Arylide Yellow. A dramatic rusty red-orange – the charismatic colour of autumn's falling leaves. Made from earth that has been heated to attain a burnt colour, this granulating watercolour adds texture and gives a glow of natural warmth. Soft folds of fabric, or the slopes of distant sunlight hills, benefit from Pompeii Red's earthen colour. Mixed with Carmine, a lovely vermillion with a slight pink undertone is produced. Potter's Pink is the lightfast pink that was used in English watercolour painting of the 18th and 19th centuries. Also used in ceramic glazes, it is romantic rose pink, delicate and neutral - a beautiful counterpoint for brighter, more saturated colours. We've recently found a new batch of the pigment, chrome aluminium stannate, which is stronger in hue and tinting strength. A dark, slightly turquoise blue-green, this innovative colour is deep and concentrated, making it an ideal choice when maximum colour strength is required. Rich forest shadows benefit from its depth of colour and complex granulation. Mix with Yellow Ochre to produce a natural looking green for stalks, reeds and leaves. Officially discovered in 1905 and named for the Latin word purpura, meaning purple, Purpurite Genuine is an intensely lavender violet that paints smoothly and easily, and has beautiful granulation. It is semi-transparent with low staining levels, so it offers great versatile in use and technique. Purpurite Genuine is a mineral with a naturally occurring, low luster, silky sub-metallic sheen. This unique characteristic allows your painting to take on additional dimension as the light interacts with your washes and glazes. Enjoy adding this natural mineral pigment to your palette. You’ll love the richness of this unique and rare purple color! A necessary watercolour for painters who embrace colour - a brilliant, slightly violet, red. Never bashful, Quinacridone Fuchsia remains strong even when mixed with water. Your light washes will be bold and, at full strength, few paints can compare to the uncompromising richness of Quinacridone Fuchsia. Completely transparent and satiny smooth, this radiant watercolor is sure to become a staple on your palette. A clean, bright yellow. Because it’s low staining, you can paint with it full strength and pull the color back to almost paper white. A Dark Green in mass tone and in washes. With the slightest hint of blue, it suggests, in washes, the hue of distant evergreens. It's good for atmospheric shadows too. Try mixing Rare Green Earth with Rhodonite to make luscious, reticulating grapy purples. Raw Sienna Light has more golden yellow tones than our Raw Sienna. This Sienna is a granulating color too, but a bit smoother in washes and is non-staining rather than low staining. Washes suggest sunny wheat fields, dried savannah grasses and other sunbaked landscapes. 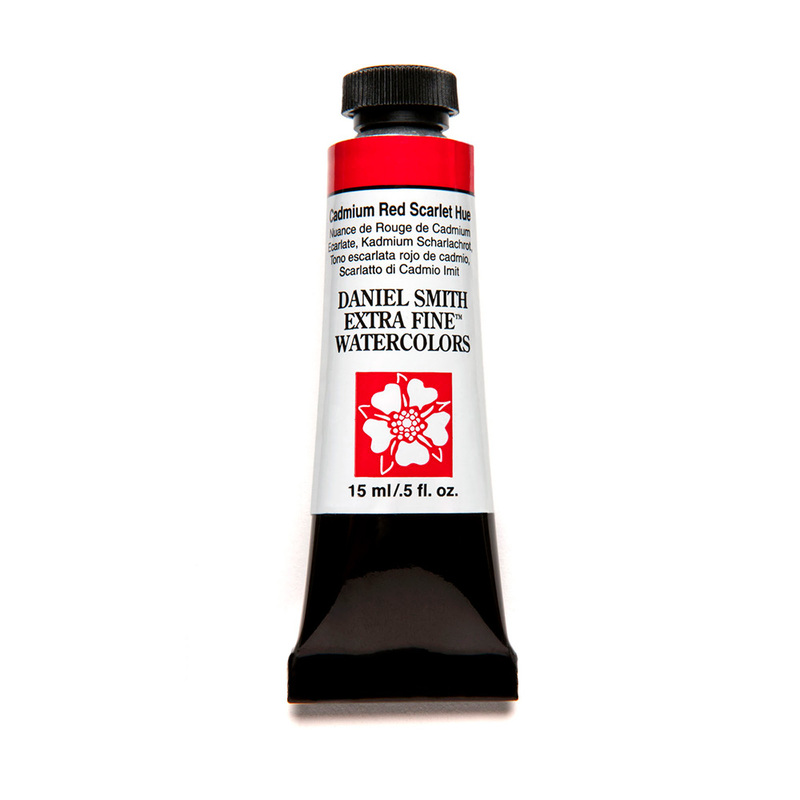 This Daniel Smith exclusive is a blend of Raw Umber with Quinacridone Violet, creating a semi-transparent medium to high tinting pigment with a beautiful deep burgundy-brown colour. The mountains of Brazil yield a beloved and treasured gemstone. Paint this soft, reddish dusky rose and watch as the mineral iridescent sheen rises to the surface of your brushstroke. This coloor, from our PrimaTek line of authentic mineral pigments, gives new definition to skies, botanicals and reflections. DANIEL SMITH Roasted French Ochre Watercolour is a strong, natural orange-brown perfect for landscapes and portraiture. If you're already a fan of our French Ochre. you'll love this versatile, palette-friendly variation. Rose Madder Permanent is a modern, lightfast formulation of the traditional color giving artists a rose watercolor with similar properties. This warm, rose pink has an ever-so-slight hint of brown making it slightly less vivid than the pink Quinacridones, and a more natural blush, perfect for portraits. For millennia, Sedona has ignited the imagination of every creative spirit fortunate enough to feel its dazzle. Tufts of sagebrush punctuate the ancient sea of sand in quiet counterpoint to the soaring red rock sentinels. With colour purity cast from a desert crucible, red spires burst on a field of pure cerulean sky, humbling the observer in absolute wonder. This ethereal red connects us to the people who were first mesmerized by the region 11,000 years ago. A wonderful neutral cocoa brown. Named for the mineral collectors who discovered it in San Diego County in 1912, it displays beautiful granulation and lets down from a dark chocolate brown to a soft cafe au lait. A unique and vibrant blue, it comes from Sleeping Beauty Mountain in Arizona where we found a deposit that lives up to our high expectations. It is lightfast and permanent, with none of the transient colour fade that plagues most turquoise. A lovely clear, bright green. Combining two yellow pigments and one green pigment, it is semi-transparent and reveals a slight granulation in washes. Enjoy its fresh, punchy quality straight from the tube or mix it with Pyrrol Orange or another bright orange to create a wide variety of landscape-friendly, natural greens and rusty oranges. A beautiful granulating pigment from South Africa, is another standout in our line of PrimaTek® colours. First found in 1944 and named for its Japanese discoverer, the rare opaque mineral ranges from grayish lavendar to pink to deep purple. As a watercolour pigment, it combines subtle fuchsia pink and warm gray in a single strongly textural colour. In a wash, the gray settles with a slight graphite-like sheen, while the pink rises to resemble the colour in an overcast dawn sky. It's a great complement to golds, oranges and greens, including Quinacridone Gold and Sap Green. Highly saturated and bold, Terre Ercolano is a natural brick red that brings an earthy sensibility to your watercolour paintings. Capture the vibrant tones of a red desert with rugged granulation or create a warm, ruddy wash with this versatile shade. This semi-transparent pigment has excellent lightfastness. Terre Verte, roughly translated as "green earth", is a classic green that has been used by artists since antiquity. Transparent and non-staining, Terre Verte is a lightfast formulation of Viridian and Raw Umber. Tiger's Eye Genuine is made from the brownish-gold stone with rippling bands of light that remind you of cat's eyes. The gemstone, a member of the quartz family, is geolically stained with dark iron oxide creating the distinctive bands and markings called the chatoyant effect. The combination of quartz and iron oxide produces a remarkable paint that is very transparent and non-staining. as well as strongly coloured and granulating. The colour is olive drab with undertones of cool ash brown. With great textural effects combined with versatile colour, this will quickly become a staple of your palette. A fully transparent non-staining rich brown completes our trio in celebration to the bamboo. Elemental and versatile it's granulating properties when blended with Permanent Green changes a sprout to a mature green of tenure and complexity. Used in a low ratio of paint to water in a wash Transparent Brown Oxide becomes almost peach and can be used as a glaze with a remarkable effect adding shadows rich in depth and mystery. A highly transparent burnt orange loves to mingle with the lamp black, settling in beneath it, mixing with it to create tones of cinnamon and tobacco. Fire seems to dance on the walls as its peach undertones nestle in with the black. Incredibly warm and non-staining, you can create stunning effects. Glaze it over the French Ochre for a warm fireside glow or layer it over itself for a rich and glowing red ochre that has no equal. Make a bold statement with an earth tone yellow that radiates warmth. In washes and glazes this amber-hued pigment gives a golden glow to your paintings. Complete transparency gives your glazes crystalline clarity and mixtures remain clean and vibrant. Add character to you work with its moderate granulation and permanence with its excellent light fastness. To create this colour, Ultramarine Blue pigment is "baked". An excellent lightfast pigment that flows freely, leaving slight granulation in washes. Ultramarine Red is considered non-staining, unusual for a red. A deep, dark, lightfast mix of siennas and umbers, Van Dyck Brown has a special reticulating property ideal for texturing a wash. Moderate staining and semi-transparent, it works well in place of Sepia. Made from pigment mined and mixed in Italy, Italian Venetian Red is redder than most and smolders with a warm intensity. An earthy red-brown with opaque, sedimentary properties, Venetian Red is great for fall paintings and applications similar to Indian Red. Drop Venetian Red into a wet Lunar Earth wash for exciting results. Venetian Red is non-staining, lifts with some difficulty when dry, but leaves a special warm afterglow when blotted at the damp state. A true blue. A blue's blue. Verditer Blue is an historical pigment with a place on every palette. Begin with a dark application, a deep azure lake, and watch how this slightly granulating paint travels quickly in water. Fade to the colour of cornflowers and create surprising effects in a wash. Dilute it to the palest baby blue. Enjoy every nuance of this wonderful new semi-transparent watercolour. Pigment mined near this ancient northern Italian city gives Verona Gold Ochre unusual warmth and clarity for an earth colour. Wisteria, like the blooms of its namesake flowering vine, is a delicate, red leaning lavender. Similar in color to Ultramarine Red but with different properties, this non-granulating and non-staining color paints smoothly and lifts easily. Wonderful for painting orchids and other florals. Zoisite, a mineral from Austria discovered in 1804, is a lush primal green with a dark - almost black - bottle green granulating surface. With minimal paint to water, the effect is a gray-green with a micro-dotted surface. With maximum paint to water, the surface fractures to a faux leather look with a distinct three-dimensional effect. Play with the ratios and be fascinated by the amount of interest Zoisite can add to your painting. I had heard abou Daniel Smith watercolours for a while now. I decided to give it a go! Thanks to your website, I could see how each colour behaved on paper. I chose the one that appeared to behave the way I like watercolour. Ken Bromley's replies: Sorry to hear that you have had a problem with your paint. With a certain few colours in the Daniel Smith range there is sometimes a separation of the Gum Arabic from the pigment, however, if you squeeze the first part of the paint out it should be fine after this. If this does not work, please let us know and we will replace/refund the tube.